I feel fortunate that in a little more than a week, I get to have a say in the political future of my adopted home. On 18 September, all those resident in Scotland get to vote in a referendum on whether Scotland should become an independent country. The last time I participated in a referendum was in 2007 in Costa Rica. Costa Ricans were asked to vote on whether their nation should join the Central American Free Trade Agreement or CAFTA. While CAFTA had been ratified quite easily in the other countries of Central America, in Costa Rica a large grassroots movement opposing the free trade agreement had emerged (see Cupples and Larios 2010). Unlike the Scottish independence referendum of 2014, I was unable to vote. But I travelled there with two compañeros from Nicaragua in support of the No campaign. The polls were indicating that the vote was very close and could go either way. We worked with anti-CAFTA activists, who opposed the free trade agreement because CAFTA meant further neoliberalization of the country’s economy. Costa Rica’s relative political stability in the second half of the 20th century, in comparison with its politically turbulent neighbours, meant there had been widespread public investment in social services such as health care, education, and telecommunications and the nationalization of banking and insurance. Costa Rica had also become a world leader in environmental protection. The No campaign felt that CAFTA put these all at risk. Having read Ian Bell’s (2014) recent comment piece in The Herald, I realized that there are some similarities with the Scottish referendum, although the nos and the yeses are in this case reversed. I am not denying the obvious differences when I say this. Voting to become an independent state is quite different from voting on a free trade deal. But it is also apparent that for many of those voting No in Costa Rica in 2007 and Yes in Scotland in 2014, the motivation to vote in this way is inspired primarily by opposition to further neoliberalization. I am not Scottish, I hate nationalism, I’m opposed to further oil extraction, but I am voting yes. Indeed, my return to the UK at the start of 2013, after living in New Zealand for 15 years, has plunged me into a deep sense of political pessimism. I am shocked at the lengths that the current British government will go to in an attempt to maintain their discursive hegemony, especially the way in which they are prepared to cruelly attack and stigmatize those directly harmed by their own policies. After living in a semi-privatized health system in New Zealand, the dismantling and privatization of the NHS in England is disturbing. It is outrageous that young people must get so indebted in order to get educated and contribute to the collective good. It totally ruins my day if I end up hearing Theresa May on Radio 4 in the morning. It is wrong that there are British people that don’t have enough to eat, while others can spend thousands of pounds a year to send their kids to private school. 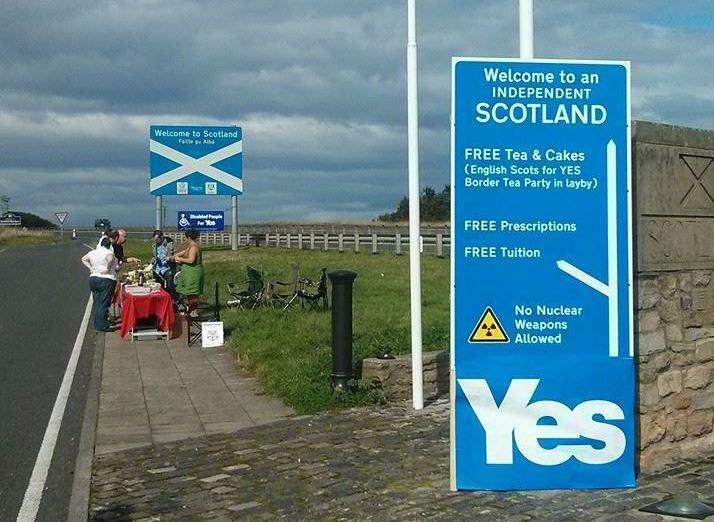 So the possibility to get nasty Tory austerity policies, along with nuclear weapons, out of Scotland is a welcome opportunity. In Costa Rica, the Yes and No campaigns were hugely unequal. The Yes camp enjoyed the financial backing of the Costa Rican and US governments and the national and multinational business sectors along with the support of the mainstream media. It ran a campaign of fear and intimidation. In response, the No campaign set about occupying alternative media sites, especially radio and the Internet, and they covered the urban landscape of San José and other cities and towns with No T-shirts, badges, leaflets, banners, posters, graffiti, and bumper stickers. They performed street theater and organized marches. They talked in their neighbourhoods about the impacts of the free trade agreement. With limited financial resources but huge political enthusiasm, the No campaign produced a charismatic and affectionate campaign. Its main symbol was a heart with the slogan “My heart says No”. 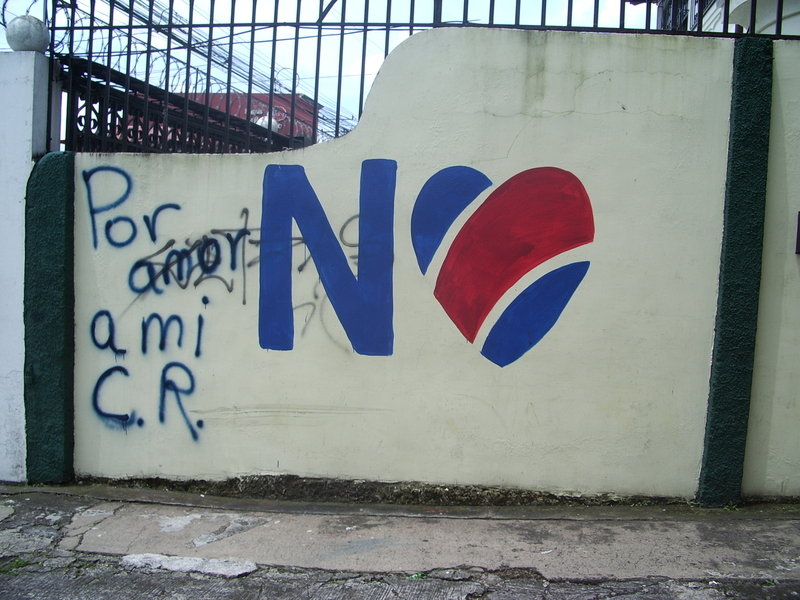 People said they were voting No out of love for Costa Rica. A similar process is unfolding here in Scotland. During the Edinburgh International Book Festival, I went to listen to Colombian London-based scholar Oscar Guardiola-Rivera talk about his new book on the coup that brought down Latin America’s only democratically elected Marxist president, Salvador Allende. With reference to Scotland, he said that revolutionary transformation requires two essential ingredients, both of which are palpable in Scotland right now. These ingredients are love and courage. The two ingredients were clearly present in Costa Rica in 2007. There are other similarities too. While the Yes camp in Scotland does of course have the backing of an established official political party, the SNP, it is also a very uneven struggle. It is up against all of the Westminster parties (curiously including Labour that in order to defend the Union inevitably aligns itself with austerity, inequality, privatization), big business, the banks and the mainstream media. (As a Labour voter, I feel disappointed they didn’t join the Yes campaign and used events in Scotland to challenge austerity in England and Wales too.) But what we saw in the No campaign in Costa Rica in 2007, and what is also evident in the Yes campaign Scotland right now, is a flourishing of bottom-up, grassroots, heterogeneous and largely leaderless politics. People are gaining a renewed or initial interest in politics, there is an enthusiastic energy on the streets, people are taking to social media to discuss the referendum and its multifaceted implications, and are covering the city and their homes with Yes signs. When large numbers of people become politically engaged, that political engagement has a legacy regardless of the outcome of the referendum. In response, the No campaign is based on fear and negativity. The attempt to mobilize fear does resonate with a substantial sector of the population, but it also produces ridicule, satire and humour. This was amply demonstrated just over a week ago when both camps released their campaign videos. 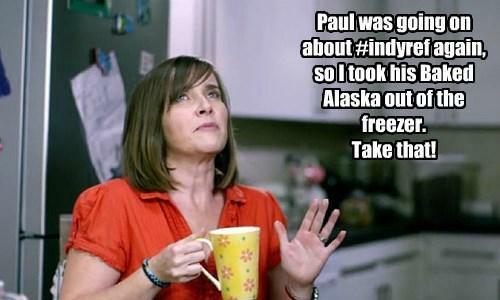 While the Yes video was fairly predictable and uncontroversial, the No video depicted a Scottish woman drinking tea in her kitchen after her husband had gone to work and her kids had gone to school. Entitled “The woman who made up her mind”, she presented herself as unthinking, not politically engaged, unlike her husband who wants to talk politics over breakfast to whom she responds with an “eat your cereal” (you can watch the video here). The sexist video was widely ridiculed, and within hours had produced a massive satirical response on social media using the hashtag #patronisingBTlady. People produced dozens of hilarious memes. 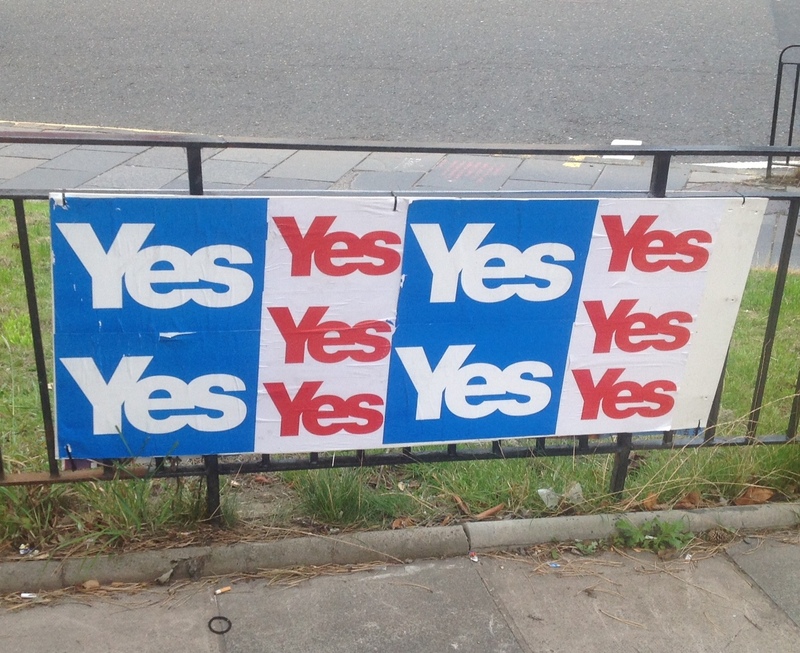 The video and the social media response might not in themselves be sufficient to swing the referendum outcome to Yes, but it illustrates the collective energy in the Yes camp, that can only fill one with political optimism. In Costa Rica, I’m sad to say, Yes triumphed by a very small margin. At the time of the writing, it seems that No in Scotland might also triumph by a small margin. Right now however, Yes remains a possibility, and one worth fighting for in the last few days of the campaign. But whatever the outcome, you cannot ignore half of the electorate who through this campaign have begun to articulate a different political vision for Scotland and the UK, one that is based on dignity for everyone, not just those who inherit wealth or are privately educated. Many might feel that voting No means voting for the status quo, and in a way it does in terms of constitutional/administrative arrangements. But in terms of cultural politics, the status quo will not be left intact. People who gained political skills and awareness and felt energized by that engagement, who began to think about what is at stake for our health service or whether it is OK to have nuclear weapons so close to the places where we live, study and work, don’t just go sit in their kitchens and cease thinking. Neoliberal discourses tell us constantly there is no alternative to austerity. They pit the low-income worker against the beneficiary, against the immigrant. It does take both love and courage to recognize that the economy is not a zero sum game, that if your standard of living improves, it does not mean that mine will get worse. If we focused on wealth redistribution rather than economic growth, our economy would probably start to grow as those at the bottom could begin to consume a little more and we’d end the damaging speculation in private housing and other sectors. We don’t do this because the political class is not interested in promoting equality. Educating, housing or caring for someone out of the public purse is actually good for everyone! Giving people opportunities does not make them lazy, it allows them to get ahead. In Scotland in 2014, ordinary people are articulating alternatives to neoliberalism – they are rearticulating the common sense of this government – and that is what really threatens the likes of David Cameron. I am glad to be living through it.